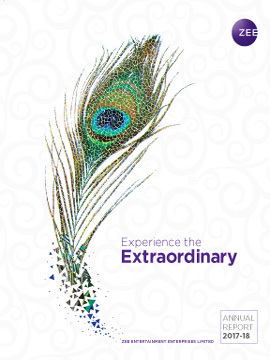 We have adopted the ideology of 'Extraordinary Together' with a vision to provide a unified brand experience, and to delight consumers across the world by creating entertainment and experiences that inspire to transcend the ordinary. It is rooted in the philosophy that from collaboration comes the strength to deliver the extraordinary. For a global company like ours, with interests across diverse verticals and businesses, the ability to win lies in being able to effectively come together and harness this strength to be extraordinary. The year gone by will be remembered for the spurt in content consumption on digital devices. It is becoming a routine in India compared to the sporadic consumption earlier. What we have seen so far is just a glimpse of the future, and digital consumption will continue to rise. This increase in consumption along with a growing digital population will drive even higher investments in content and technology. While original content for digital will become a norm going forward, the industry will experiment with new-age technologies to offer an even more engaging experience to viewers. Technology has already made digital consumption more accessible, and the ongoing developments in video compression and transmission, along with increasing computing power, will make it ubiquitous. This brings us to the much-discussed global question - will digital make TV irrelevant? Perhaps, one day it might. In most countries, the shift from linear to on-demand was catalysed by either a significant cost differential or limited availability of quality content, both facilitated by a high wired broadband penetration. In the absence of these catalysts, and considering the fact that India is a multilingual country, we believe that the media landscape in our country would evolve in a different fashion. For the majority of our population, video content is the primary and the most affordable source of entertainment. Still, we lag behind our peers in per capita entertainment content consumption. In India, a television is shared by the entire family and hence mobile has become the default second screen for many. The fact that TV viewership continues to grow along with this multifold increase in digital consumption, suggests that in India, rather than debating ‘TV versus digital’, we see it as 'TV with digital'. From a marketer's perspective, television and digital serve largely different marketing objectives. Television’s simultaneous reach to the masses and high engagement levels makes it the default choice for brand-building, the primary goal of marketing. Even in the medium term, television will continue to be the leader in terms of reach and time spent, retaining its position as the preferred medium for advertisers. Digital, on the other hand, excels in targeting, thereby complementing television campaigns. It also helps in widening the advertiser base by providing a platform to SMEs with limited budgets. Marketers today are already using both television and digital mediums for holistic advertising planning, which will further get a boost with the availability of cross-screen measurement data. Technology has indeed democratised the means of content production and distribution, giving enormous choices to the consumer. This vast choice, however, is thinly distributed across a large number of platforms, requiring consumers to shuffle between different apps and pay for multiple subscriptions. This makes content discovery and consumption a cumbersome experience. We believe that eventually, a platform that offers an extensive and exhaustive array of content and has an intuitive interface, will become the one-stop entertainment destination for consumer. ZEE5, our recently-launched digital platform is vying to be this one-stop entertainment – 1,00,000+ hours of content in 12 languages across genres, offers a plethora of choices to every consumer. Our exciting line-up of digital original content, an expansive movie library, collection of international shows dubbed in Indian languages, along with news and music, make it stand out in the crowded OTT space. Features like multilingual user interface and voice search facilitate content discovery and consumption for the diverse Indian audience. We are encouraged by the initial response to ZEE5, and are confident that it will continue to gather momentum as we expand our content library and enhance the user experience. We believe digital content consumption in India has reached an inflection point, and we will continue to invest in the digital business to attain leadership. In FY18, television viewership in India continued to grow on key parameters: television households, reach and time spent. While the viewership grew across age groups, the kids and youth segments witnessed the highest growth. Regional channels continued to see an uptick in viewership, partly due to increase in availability of quality content in local languages. We were the number one non-sports entertainment network driven by the strong performance of our portfolio of Hindi, regional and movie channels. We will continue with our strategy of expanding the regional portfolio by entering new markets and adding products in existing ones. In addition to general entertainment channels that telecast original content, movie channels are an important growth driver for us. We have significantly expanded our movie library over the last year, in both Hindi and regional languages, which should help us consolidate our leadership position. It was a remarkable year for the Indian movie industry with domestic and international theatrical collections reaching new heights. While increasing multiplex penetration has been the key driver for the improving economics of the movie production business, OTT platforms have accelerated it by providing a sizable revenue stream, especially for niche movies. Zee Studios, with nine movies in three languages and its second National Award, established its presence as a leading movie production house. This gives us a strong foundation to scale up our movie business. Digital streaming has reversed the declining fortunes of the music industry, globally and in India. Zee Music Company, in a short period of 4 years, has built a strong catalogue across 11 languages, emerging as the first pan-India music label. Our movies and music content widens our audience base, especially amongst the male and youth segments. Our international business focused on building reach and increasing audience engagement across geographies. We reached out to new distributors and strengthened our existing partnerships to increase our consumer base in each of the markets. Both categories of channels, serving the diaspora and the native audiences, expanded their reach through launches in new territories. We are adding local original content in both these categories, in a measured way, to build loyal viewership. Additionally, our focus on ground events is helping us improve engagement with our South Asian audience. The organised live events industry continues to grow, with a variety of events gaining audience acceptance. The growth could have been much faster with the availability of skilled workforce, better infrastructure and a simpler compliance framework. Zee Live successfully executed two properties - 'Wicked Weekends' and 'Zee Theatre Tour'. Several IPs are at a conceptualisation stage, which will be rolled out in due course of time. Implementation of GST hampered the growth of M&E industry in the first half of the year, just as it was recovering from the lingering impact of demonetisation. These policy actions had a temporary negative impact on the growth trajectory, but we believe that they will aid the long-term growth of the industry. Strong economic growth, rising disposable income and discretionary spends, coupled with low entertainment consumption in the country, presents a favourable landscape for the industry. Our consolidated revenue grew by 3.9% in FY18 to `66,857 million. Revenue adjusted for the sale of sports business grew by 15.2%. EBITDA margin for the year stood at 31.1% and EBITDA grew by 7.7% to `20,761 million. EBITDA growth for the year was affected due to investments in new businesses, the impact of GST, and investments in the brand refresh exercise. Our strong performance would not have been possible without the hard work, enterprise and ingenuity of our employees. At ZEEL, we strive to enable our people to achieve their full potential. Our employee outreach initiatives such as SAMWAD - one-to-one conversations with managers, employee feedback programme, and quarterly interactions with the senior leadership team, provide essential inputs to constantly improve the work environment. I am happy to share that ZEEL was recognized as one of the best places to work by Great Place to Work® India. Being a medium of mass reach, we are also cognizant of our social responsibilities. With stories that highlight relevant issues like women empowerment and education amongst others, we have made it our mission to create impact through our content. I would like to extend my earnest gratitude to our audience, employees, partners, peers, shareholders and the Board, for supporting and guiding us in all our endeavours, not just in the past year, but over the last 25 years. Individually you inspire us, and together you drive us to excel in all our ventures, enabling us to deliver a strong and consistent performance. I am confident that with your unrelenting support in the future, we will achieve the Extraordinary, Together.